It’s Casseroles for a Cause Time! Time flies when you’re having fun! It seems like it was just yesterday that we were out collecting hundreds of casseroles but it was actually 3 months ago! Crazy! We’re hearing from our partners just how important our Casseroles for a Cause has become to them. For some clients at The Arc of Montgomery, it means having a meal to eat because their check went to cover their prescription costs and there wasn’t enough left for groceries. For Shepherds Table it means having meals on hand to lessen the burden of meal planning on the staff and allows them to budget for more fresh and healthy ingredients for the 19 meals they serve each week. For families who receive the casseroles at Difference Makers, it is the dignity of choice. The opportunity to select from an array of delicious homemade meals they can proudly serve to their families is so meaningful. What’s even more exciting is that our partner organizations have requested more casseroles! The need is even greater this year as typical donation resources are being shared with other timely issues facing our community. By filling the freezers now in October, organizations will be better situated to prepare and plan for the upcoming months. But we can only do this with your help! So let’s do this! Let’s deliver over 2,000 meals to our friends at Shepherds Table, Interfaith Works – Carroll House Men’s Shelter, The Arc Montgomery County, and Difference Makers. 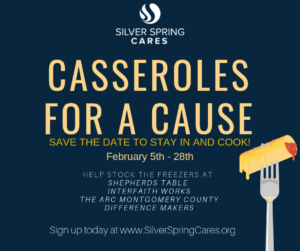 From February 5th – 28th, Silver Spring Cares is partnering with Shepherds Table, Interfaith Works – Carroll House Men’s Shelter, The Arc Montgomery County, and Difference Makers to help fill freezers with delicious meals that will feed hundreds of folks in our community. We need your help to stay home and cook! Then we’ll even come by to pick up and deliver your casserole! You will receive an email with easy instructions, tips on how to host a successful night and even suggested recipes. We’ll also snail mail you labels for your casseroles! Whether you make it a social gathering or you cook by yourself, you are helping to provide a warm and delicious meal for our community’s most vulnerable. In the week following, simply arrange a time for us to stop by to pick up your casserole. We’ll take care of delivery for you.